Third of eight homeschooled children, John Crist never dreamed he’d share the stage with top comedians Dave Chappelle, Seth Meyers, Trevor Noah and Dana Carvey. Last fall, his first headline comedy tour sold-out while his viral videos have gained 300 million views online (and counting). We caught up with John Crist backstage at King’s Fest in northern Virginia, a Christian music and arts festival which celebrated 20 years this summer. Crist has shows coming up in about a dozen states, with others being added, according to his team. The Stream: Some of your most-viewed videos poke fun at millennials. Why is our generation such comedy gold? John Crist: I feel like it’s the disconnection to reality. A lot of things I make fun of are like Essential Oils. People say, These oils are curing everything! Come on. Few people online have the following to make a video go viral. Let’s say I have around 200,000 YouTube subscribers. That Millennial International video has like three and a half million views. We rely on other people to see it, connect with it and say, My brother has to see this. A comic takes frustration and turns it into a joke. When I see millennials, I just sort of laugh. Yet that video came from a real point of anger. Nearly every day, I get up at four in the morning, drag two boxes of merch and take a flight across the country to make a living. That’s how life works. But I used to have a friend who was on “missionary support.” This guy woke up at ten, got on Facebook for a couple hours and then went to coffee with someone. I’m like, Dude. Come on. Now I make that joke, and I’m not mad! (laughing) A lot of times some people get upset or offended at a joke, but everyone else is dying laughing. If there’s no truth to it, it doesn’t land. The Stream: How do you respond to critics, especially among Christians? Think about it. If I am a Christian, these jokes are hilarious and we can laugh together. But if I’m not, these jokes are now very offensive — making fun of communion or Christian weddings. Truth is, I am a Christian who loves Jesus. I think the local church is our only hope. That being said, we do some weird stuff. How do we manage people who are offended or constantly criticize? We don’t. We used to try to follow up: “No, that’s not what I meant. You misconstrued it.” Now we don’t. We like people to think for themselves. If people are offended, that’s OK. By all means, voice your view. If I’m allowed to voice my take, so are they. If some millennial is angry and thinks it’s not funny, go ahead and post that on my video. I can’t spew my opinions for an hour a night and be angry when somebody differs. The Stream: With today’s political polarization, how has the world changed for comedians? John Crist: When people don’t get the material for political reasons, I just have sympathy for them. We had someone write up this huge “exposé” on one of my jokes. The team here and I are thinking: Imagine that person’s home life. It doesn’t sound fun. You post a joke about Chick-fil-A and someone’s like, “You hate gay people.” They’re not actually mad at me. I’m not a huge President Trump supporter, but people are angry at him. Two years ago, everyone loved him. He was a TV star and people were like, “Yeah, I know who that guy is.” Today, the anger is so vicious. The anger makes no sense. He now represents every boss that fired you, the dad that left you, a boyfriend that cheated on you. He is kind of every bad thing. I’m like, “Y’all don’t even know him.” But they’re not mad at him. There’s now a platform and this is a welcomed opinion. Laughter is good medicine. The joy of the Lord is our strength. The more sadness and depression people face, the more we need comedy. It’s a weapon nowadays. If you could come out with me on the road, you’d see where I get to perform at crisis pregnancy centers, Alcoholics Anonymous meetings, homeless shelters and prisons. Those are the best shows. They’re not going to get mad at some “Homeschooling is the goodest” joke. When you’ve experienced death, loss, hurt, pain and depression, then the surface stuff is funny. They’re dying to laugh. People in those places have often felt the deepest and realest pain. Sometimes we middle-class Christian people just need to loosen up. The Stream: Do you see being a comedian as part of your calling as a Christian? The whole New Testament is the disciples writing letters to these churches, saying, “What are y’all doing, screwing around with adultery? You are hypocrites, not taking care of the poor.” They were calling people out. I’m not by any means comparing myself to Jesus. Sometimes I mess up. I’ve had to say, “That joke was too far, it crossed the line.” You’re doing a hundred jokes out there, trying out many of them for the first time. Even batting 99 percent is great. The problem with many creative endeavors by Christians is people say, “If it’s Christian, we have to love it.” We have to go to the movie or support the band, even though they may be terrible. Inversely, when they decide it’s not Christian, they shut it out. I’d rather have folks decide for themselves, rather than spoon-feeding them. The Stream: What’s the most difficult part of being a comedian? 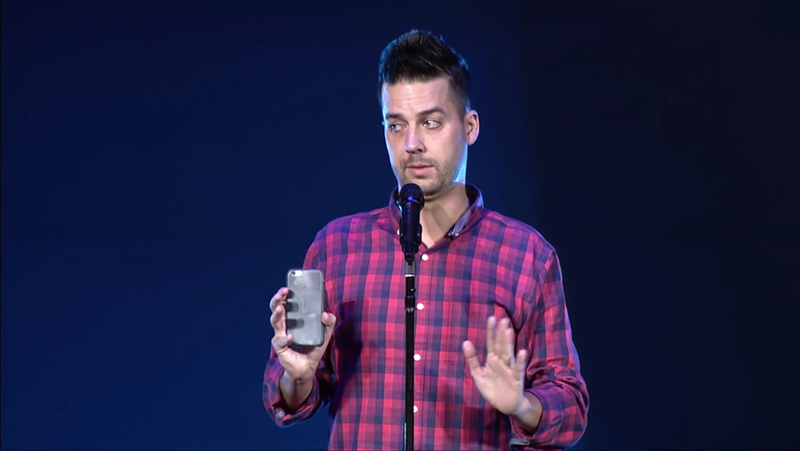 John Crist: The problem with comedy — OK, it’s not a problem, I live for it. But if you’re a musician in a band, you can write a song, practice it, polish it, get it really good and then take it out to the stage. I can’t. I have to have a thought and literally say it in front of 3,000 people. I’ve never said it before. Every person has a unique point of view, having grown up in a certain region, in a certain denomination, with certain political leanings. You could laugh at something and another guy shrug like, “That’s not funny.” You literally can’t predict it. The worst would be if you think something is funny and it’s not. We’re in Virginia, a middle-class, mostly white, Christian, Trump-supporting crowd. I’m thinking of the jokes that connect with them. It’s stuff about millennials, gluten allergies, Essential Oils — these type of things. If I’m doing a casino in Portland, it’s different. If people see me in a comedy club versus a church, is it like dirty in the former? It’s not. My stuff is all clean, and mostly faith-based. At a club, where everyone is not Christian, I wouldn’t go into a Samson and Delilah bit as I did here at King’s Fest. What region of the country, what denomination of church you’re in — you keep these things in mind when making jokes. The Stream: Growing up, did you enjoy making your friends and family laugh? John Crist: I remember being with my brothers at the park and getting them to crack up. I was never like “make a joke” funny, more like roasting people for being disingenuous. Now that has turned into agents, managers, travel schedules, all this social media. But it’s still the same feeling. The same feeling you get making six of your frat buddies laugh on the porch at the Pi Kappa House is the same feeling you get making 4,000 people laugh. People say to a comedian, “It’s unfair that you can just get up there and say whatever you want.” But it’s actually the opposite. A comedian can only say what is in your head. One of my favorite comics is Jerry Seinfeld. He has a bit about being in the shower. “Have you ever seen that lone piece of hair, stuck to the tile? How did it get there? What was its journey?” He can only make that joke because you relate to it and laugh at it. My inboxes are full of people sending me church signs or Christian marketing. They say, “Please make a joke of this.” Like: Have you ever watched a commercial for a medication, and the side effects are worse than the thing it’s supposed to heal? They’re not comedians, but they notice contradictions and have the same feelings I do. I only bring it to the surface and maybe verbalize it in a clever way. Find out online where John Crist has upcoming shows. Check out his YouTube channel for more videos. 7 Signs you Grew up Christian and Trying to Find a Church on Vacation are pretty good. Love what He’s doing for the Kingdom!